Nyogen Senzaki (18? ?-1958) was a Japanese-born Zen monk and teacher. A student of Soyen Shaku, he was one of the first monks to preach Zen in America. Though his early life is shrouded in mystery, Nyogen is known to have been born on the Kamchatka Peninsula in Siberia, to a Japanese mother and a Russian or Chinese father. An itinerant Buddhist monk discovered the infant near the frozen body of his mother, and returned with him to Japan. He was subsequently adopted by a carpenter named Senzaki, who lived in Aomori Prefecture. The origin of his given name «Nyogen» (Japanese for «non-dweller») is not entirely clear, although he most likely adopted it around the turn of the century. Nyogen was a precocious youth and a consummate scholar. By the age of twenty, he had read the entire Tripitaka in the original Chinese, and was an accomplished poet. He developed an extensive knowledge of early Zen koans. 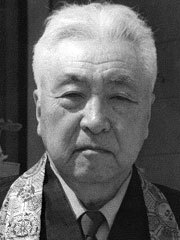 In 1905, he accompanied Soyen Shaku to San Francisco, where he learned English and began translating and annotating Zen works. Following the Attack on Pearl Harbor, Nyogen was among the tens of thousands of Japanese-Americans to be relocated to internment camps. He would spend the duration of the war in Heart Mountain, Wyoming. At the conclusion of the war, Nyogen moved his «floating Zendo» to Los Angeles, to devote the rest of his life to teaching Zen and writing books. Among his students at this time was Robert Aitken. Nyogen maintained a long-term correspondence with Soen Nakagawa, an unconventional young monk practicing in Japan.